Naturally Dyed Wool and Fleece. I have thoroughly enjoyed being in my garden this Summer creating colour! My mission was to prepare a fleece to be dyed unspun as well as hand spun so as I could produce my own naturally dyed yarn. I wanted to be outside and brew all the leaves and bark in large pots over an open fire pit. It feels more down to earth and so much more satisfying to be outdoors making a fire and taking the dye materials from the garden. My sister joined me which made it lots of fun and she is rather good at cooking our lunch on the mini BBQ too ( a link to her blog is on my previous post ). Eucalyptus leaves and Brazil wood bark dye baths. We managed to get a lovely array of colours with the first exhaust then, adding iron to some dye baths on the second exhaust to gain shades of colour. I wanted to have back up in case it didn't work. 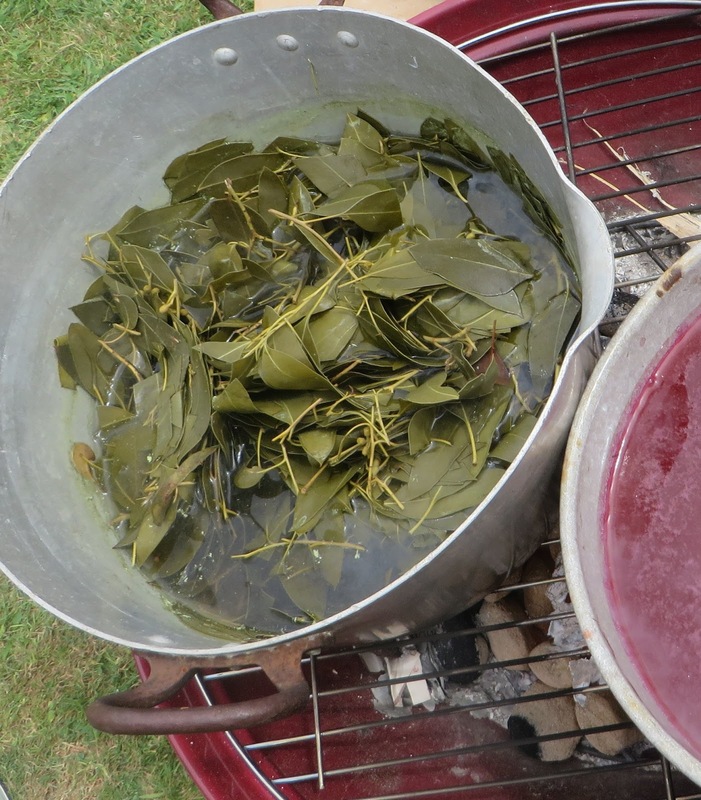 So I prepared two Vat Dye Pots one for woad and the other Indigo. Indigo was straight forward vat dye with Indigo powder which works really well. My woad was my own collected seed, planted, grown in the garden and harvested on the day. My worry was that if I overheated the leaves they would lose their blue colour properties. Having harvested a good crop I was ecstatic when I got to the whisking stage in the procedure to see YES the BLUE was there!! 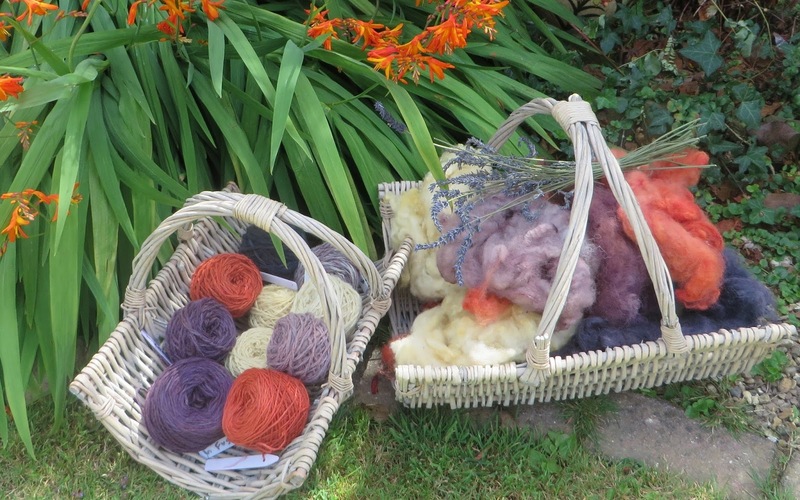 Then it was time to dip the wool in the pot and wait .......... slowly lifting the skeins out into the open air and allowing the oxygen to reveal the most magical transformation. The chair on the left is the indigo dyed wools and the chair on the right fleece and skeins of my very own home grown woad. As I wanted to experiment I over dyed some Eucalyptus dyed wool - yellow in the woad blue and achieved a True Green which you might be able to spot in the photo. 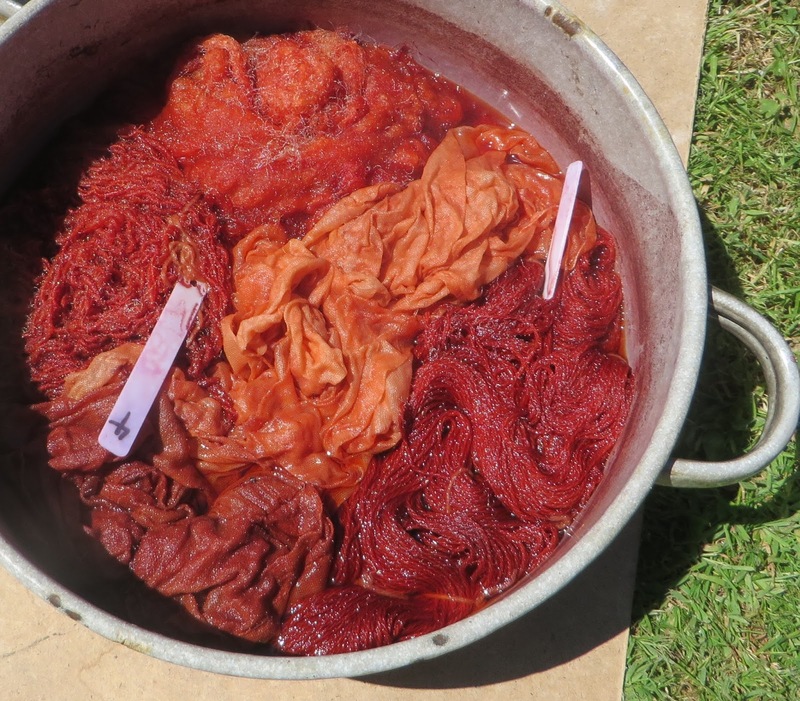 I will certainly continue with my colour making with natural dyes and definitely grow another woad crop next year.